Diamondback are a company who have been building great bikes for so long that their name is synonymous with quality, affordability and style. Their reputation has been honed over many years and their riders can opt for an ultra cool, and skilfully designed BMX or a sturdy, tougher than tough mountain bike that is ready for any terrain you care to throw it at. As always, entry level bikes have a higher quality spec than you might imagine for the price bracket – a surprise given the quality and the fantastic name. Diamondback are back with another fantastic mountain bike to add to their already jam packed high quality roster. The 2013 model Sorrento features massive 26 inch wheels, perfect for tackling tough terrain but equally adaptable to trail runs, paths and normal roads. While perfectly designed and set up to handle off roading, the Sorrento really shines on trails. With a tough heat treated and butted aluminium frame, there’s no need to fear anything as the bike just eats up the ground, and the excellent 60mm shocks at the front mean that bumps and potholes are barely noticed. No matter what stage you are at with mountain biking, the Sorrento has something to offer you. Any experienced cyclist will immediately get to grips with this bike, which feels right in its element on trail runs, but beginners will benefit from the stability offered by the fantastic double wall alloy Weimann made rims, which at 26 inches strike the right balance between providing enough size to tackle large obstacles while being small enough to help you to manoeuvre the bike through tricky twists and turns. Excellent brakes from Tektro give you all the confidence in the world whether you’re flashing along a trail or slowly tackling a serious descent. A healthy 21 gears mean that hills are a zip, and finding a low gear for long fast runs is a breeze. Shimano provide the running gear, with Altus changers and back derailleur, and a tourney front derailleur. The bike comes in five different sizes, ranging from 14” through to 22”, and looks great with a no nonsense grey paintjob. All in all, Diamondback have done it again. They have managed to produce a well put together bike which offers something for beginners right through to experienced riders, all at a great price. We’re yet to come across a Diamondback which doesn’t do exactly what it says on the tin, and we’re in that position again, just wondering when they will put a foot wrong! 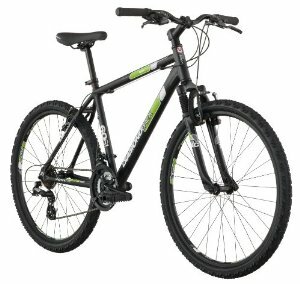 A great bike with a great price tag that has enough about it to be a viable bike for the experienced trail rider. This entry was posted in Bikes, Diamondback, Mountain Biking, Reviews and tagged Diamondback, Diamondback 2013 Sorrento Mountain Bike, mountain bikes, Sorrento. Bookmark the permalink.